The perception of generosity is an important element in a restaurant’s ability to win my affection and loyalty. The new café in Waterstones on Gower Street (morbidly named Dillons, after the bookshop that Waterstones’ bought and killed off) serves a large portion of beans on two pieces of sourdough for £2.50 with cheese no extra cost, and tea in a pint mug: I’m theirs forever. Side dishes are a good place to look when searching for a magnanimous spirit: nudged to the bottom of the menu and without headline-grabbing ‘foraged’ ingredients, they are the first place that miserly chefs cut corners. In lesser establishments, ordering a side is an annoying, unaccounted-for expense when main dishes don’t actually give you enough food to constitute a complete dish. Once, at a London steak restaurant named after the Flatiron district of New York, I looked on in disbelief as a waiter served me french fries and a salad so tiny, and for at least £3 each, that I laughed at them. The portions were smaller than a McDonald’s Happy Meal and twice the price. Side salads are often victims of limp, browning leaves, ill-considered components and the occasional presence of bugs. 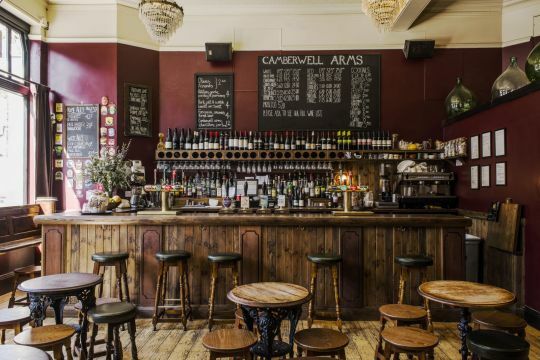 The Camberwell Arms is another matter. Theirs is so good it makes you feel you should add them to your Christmas card list. A (really) large and always fresh heap of pale chicory, bitter purple leaves and sweeter lettuces is dressed with a gentle and well-seasoned mustard cream dressing. The leaves change each time, but not the proportions or the consideration given to the mix. The chefs have transformed a dish that is more often a depressing afterthought into a swoonworthy luxury, and by doing so, have underscored the integrity and kindness in their kitchen.